Day 12! The Gift Itself! Final Day! What’s left? Wrapping the gift! Check out these creative gifting products for dressing up that special gift! 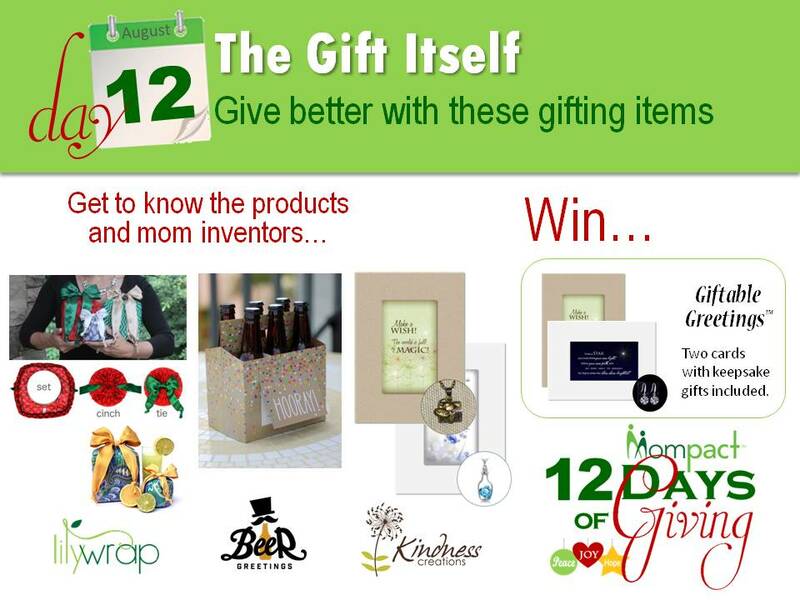 Learn about the mom business owners behind them, and enter to win today’s drawing for two Giftable Greetings™ by Kindness Creations. Today’s question: What is at the top of your holiday wish list this year? Enter your answer to win the daily prize here. Today’s prize is two Giftable Greeting cards with keepsake gifts included. lilywrap started out as a guilt trip. After holidays with the family, we saw smiles and gifts galore – and waste. Our family filled three huge garbage bags full of torn wrapping paper. This was simply not going to work. We grew up with “reduce, reuse, recycle” hammered into our brains every earth day – yet this was 2011 and we were still using (and throwing away) traditional paper gift wrap. A little research revealed that the average American spends 3 hours wrapping holiday presents (not including, birthdays, wedding showers, baby showers, etc.) and that we create 4 million tons of paper gift wrap waste each year. The simple response to this modern day tragedy was a reusable gift wrap. There were several options available, including reusable gift bags and even some fabric options. However, we soon found that gift bags are not as durable as advertised and the inelastic fabric options limited the size and shape of gifts we could wrap. 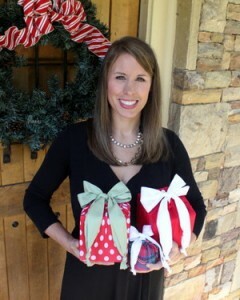 Eureka moment: Why not create a stretchy fabric gift wrap that could flex and fit to all shapes and sizes? Sounds simple, right? Riiiiiiiight. After nearly a year of research and development (and development and development), we eventually came up with our patent pending stretchy fabric gift wrap that is easy to use and mimics the look of traditional paper gift wrap, bow and all. 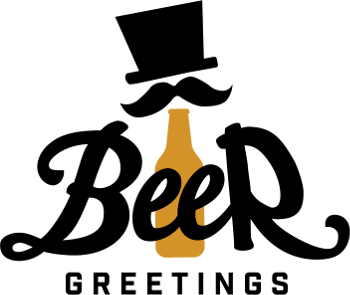 After launching lilywrap gift wraps, we introduced additional products including Beer Greetings under our company, Smartsy Brands. As founder of Mompact, I’ve pursued my invention ideas — creating prototypes, filing provisional patents, sourcing manufacturers, exploring wholesale distribution channels and all those start-up functions. It’s a long process, and certainly not easy. But, the experience introduced me to hundreds of other moms on the same journey. Before my “million dollar ideas” (ha! ), I spent almost over a decade in a marketing career which I still enjoy doing. 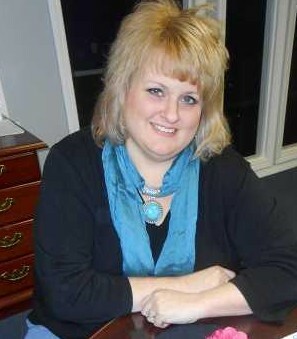 In addition to running Mompact, I’m a marketing consultant for large brands and small businesses. I enjoy learning about companies and their products and finding new ways to market them. Along with my husband, I’ve developed software tools for marketing, social media management, and even managing company kindness projects. Working with all the mom business owners, I’ve learned that doing what you truly love is one of the biggest indicators of how successful your business will be. I took that to heart about a year ago and refocused on some of my products that involved kindness, and spreading love and encouragement. I combined my love of cards and simple gifts with my love of random acts of kindness through my site, SpinKindness.com. With the help of corporate sponsors, we organized hundred of kindness activities over the past year. My two daughters, ages 9 and 12, have been involved in the kindness work with me and also asked to be involved in the creating products. We launched Kindness Creations together. My older daughter is a wiz with website development and my youngest loves helping with the packaging and shipping orders. We brainstorm product ideas together and have plans for lots of new products that represent our interest in spreading kindness and encouragement. Our focus right now is on growing Giftable Greetings, a line of handmade cards with keepsake gifts attached. A portion of all proceeds from Kindness Creations is contributed to local kindness projects. Read More. Support all of our Mompact mom inventors who helped #SSGiving bring gifts to so many this summer! Visit their pages and follow them on social media. You can meet them all here. 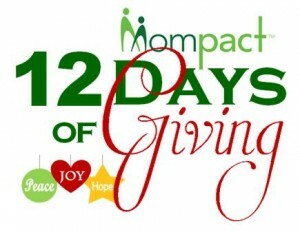 See upcoming Days of Giving here.